Jubilant Biosys Ltd & Jubilant Chemsys Ltd are part of the Jubilant LifeSciences providing innovative drug discovery services to the global pharmaceutical industry through its locations across India and the USA. Jubilant offers integrated discovery services spanning across Target Identification/Target Validation (TI/TV) to Lead Optimization (LO)/Preclinical candidate (PCC), for multiple therapeutic areas. With well enabled capabilities in Oncology, Metabolic Disorders, CNS, Pain, Inflammation, Fibrosis and Respiratory diseases Jubilant has rapidly emerged as a leading collaborator for biotechnology and pharmaceutical companies worldwide. In each of these therapeutic areas, Jubilant has developed in-depth expertise in discovery informatics, computational chemistry / molecular modeling, medicinal chemistry, structural biology, biology, in-vivo and in-vitro biology and translational sciences. 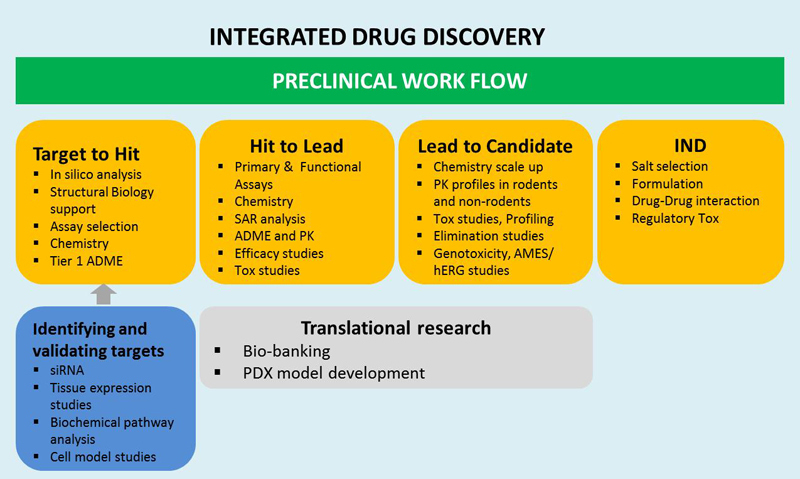 The discovery team focuses on early stage lead generation across various target classes and uses a wide range of technologies, including high throughput screening, molecular modeling, medicinal chemistry, structural biology and computational chemistry, to identify novel start points that are then selectively taken through the preclinical discovery process. Our expertise in Animal Pharmacology with multiple PD and disease models enabled, help us deliver IND candidates. 700+ people working on drug discovery spread across two locations Noida and Bangalore in India. Demonstrated expertise: ~50 programs leading to preclinical decision outcomes with some leading to successful clinical outcomes across multiple therapeutic areas. Exploratory and translational outcomes across target and disease platforms enabling “right shots at the goal”. Integrated and robust preclinical and “early stage POC” portfolio management. Jubilant collaborates with the world’s leading pharmaceutical and biotech companies, academic institutions and research foundations. Innovative and rigorous science, excellence in execution, and absolute integrity, combined with flexible business models has enabled Jubilant to deliver valuable outcomes in a relatively short period of time. The hallmark of Jubilant’s collaborative model is the creation of value to their partners.